Nat Fisher’s fluid for forming sudsy spheres may be the start of a $1,000,000 business. BUBBLES FISHER is no strip-tease dancer as the name may imply—he is Nat Fisher of Hollywood, Calif., who says there are three things that will never die: marbles, tops and bubbles. 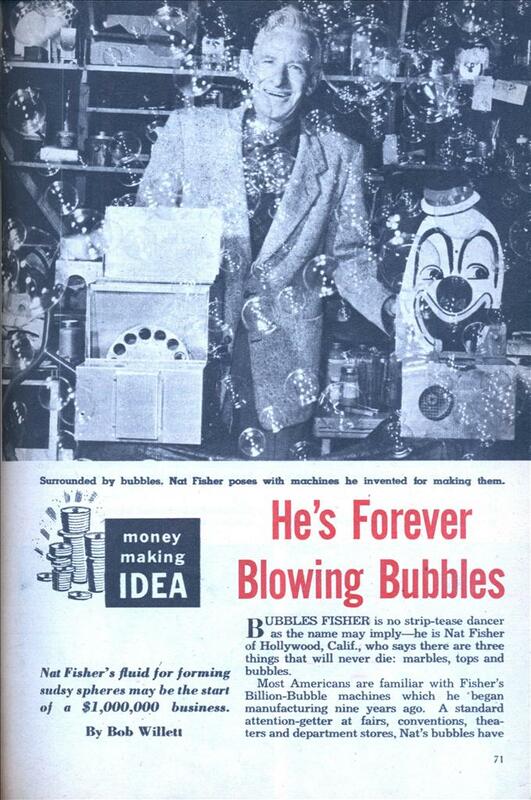 Most Americans are familiar with Fisher’s Billion-Bubble machines which he ‘began manufacturing nine years ago. A standard attention-getter at fairs, conventions, theaters and department stores, Nat’s bubbles have also become an important part of ice show, circus, nightclub and TV performances and his miniature plastic bubble-making machines are sold in novelty stores throughout the nation. Nat lives up to his nickname, Bubbles, by constantly coming up with something new, producing frothy spheres ranging from pea-size .to 100 inches in circumference. The ingredients of his bubble-making fluid, which is more potent than any other known bubbling agent, is a well-kept secret at his plant in Burbank, Calif. But its effectiveness is well known. The liquid produces bubbles of such strength that they bounce or split into several smaller ones before breaking. The big ones, which often drift for miles, are used for experimental purposes by UCLA, USC and Cal. Tech. Pittsburgh-born Fisher’s background is well suited to the bubble business. He’s been a printer’s devil, singer, actor, theatrical manager, song-plugger, stage and screen writer and a producer-director. Chemistry was Nat’s favorite school subject and he made a hobby of experimenting in his own laboratory. This activity began to pay off in 1924 when he patented Liquid Glass for cleaning, waxing and glazing automobiles with one two-ounce application that lasted a year. Nat became a bubble expert after his wife, Evelyn, stood in what she thought was a nylon line and found that it had been formed by people taking turns watching a man blow bubbles in a store window with a little plastic loop. When she casually remarked to her husband that there must be an easier way to blow bubbles, Nat began working out plans for a bubble machine in his home workshop. His biggest problem was finding a more satisfactory fluid than soapy water, something to suit his idea of blowing balloon bubbles with a loop six inches in diameter. For weeks he bubbled with enthusiasm and little else. Vegetation in his backyard suffered from the dumping of a hundred different solutions, none of which were any good, but all bubbly enough to make pouring them down a drain decidedly impractical. One morning at three a.m., a police patrol car caught him in the middle of the street experimenting with a wash-tub full of his fluid. The officers listened patiently as he explained that he was merely blowing bubbles. They put him down as hairbrained but harmless. “Some people thought I was missing a few marbles,” he says, “but I finally hit on the right formula. My method was mostly one of trying anything once and success came after I started using chemicals that had never been connected with bubbles or even frothing. The right formula resulted in 50 to 60 bubbles from one dip of the loop. They first burst on the public from a machine he made for a Los Angeles auto show at which a new attendance record was attributed to their attraction. There was an immediate demand for do-it-yourself equipment and Nat put his wife and friends to work packaging loops, trays and fluid for sale at a dollar a kit. They sold several hundred a day during the 18-day show. Nat then refined his first make-shift machine, designing it for quantity production. 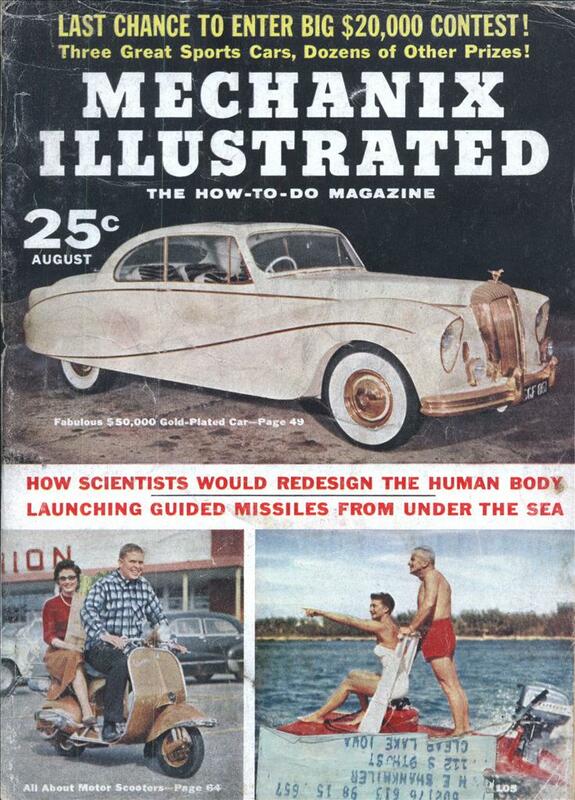 It featured a perforated metal wheel revolving in a trough of fluid in front of a blower. A film of fluid clung to each opening and bubbles were blown as they passed the air stream. By varying distances, speed and pressure, he was able to produce bubbles at different speeds, in different sizes and which would either float or shoot straight out. One improvement led to another and Nat purposely kept his patents pending as long as possible, finally making 20 claims to cover the many exclusive features of his machines. The latest model has a gallon feeder can and will operate unattended for a week at a time, turning out plain, colored and/or scented bubbles at the rate of 50,000 per minute. He’s now working on a five-part plastic kit for construction of a small automatic machine that is within pocketbook range of the smallest businessman. He’s planning to put it on the market in a year or so. The bubble king’s initial investment amounted to several thousand dollars before it began paying off. He sells his automatic machines for as much as $250 each. His bubble fluid runs as high as $20 a gallon and movie and TV studios rent his big automatic machines for $25 a day instead of buying them outright. Nat points out that he now has more business than he can handle and is getting behind on his orders. He did not originate the dime store bubble kits; they were only the inspiration for his bubble inventions. He did bring out a king-size ring but has concentrated on the revolving wheel for several years. His miniature machines selling for a dollar have been sold to children and adults and are widely used for promotional „ purposes. Fisher is convinced that $100,000 invested for advertising his bubble blowers on TV throughout the country could quickly make his bubbles a million-dollar business. He made a few appearances on TV last year, advertising his miniature machine. The response was overwhelming and Nat was amazed to get more orders from adults than children. At the rate Nat Fisher is going, he’ll soon have us all blowing pretty bubbles in the air.